With the arrival of warmer temperatures, Minnesotans may be putting their bags of de-icer into storage. But all the salt they sprinkled on the ground all winter in the name of safety? In fact, it’ll be here in July — and much, much longer than that. The sodium chloride, or salt, in most de-icers is now running off into lakes and streams with the meltwater, and it does not break down or disappear. And with no good way to treat it, the chloride has been accumulating in Minnesota’s waters, slowly poisoning them. Concerned about this emerging pollution problem, state lawmakers are devising a new way to break Minnesota’s winter salt habit. Bills currently in House and Senate committees would create a statewide program to certify the professionals who apply salt to sidewalks and parking lots, so they know how to best control ice without using excessive salt. The certification would cost individual contractors up to $350. The bills target private snow and ice control companies who contract with property owners and managers. The measures are designed to help shield contractors from the threat of lawsuits, saying that certified applicators are not liable for damages from hazards resulting from accumulated snow or ice as long as they used “best management practices” for de-icing. Addressing the fear of liability is crucial to changing the salt culture, said Brooke Asleson, a water pollution prevention coordinator for the Minnesota Pollution Control Agency (MPCA). “The fear of slip-and-fall lawsuits is really a big barrier for them,” Asleson said. Homeowners out sprinkling their steps are not a significant source of the state’s growing chloride contamination, said Asleson, and are not part of the bills. Whether the liability protection is sufficient isn’t clear. The bills also specify that liability isn’t limited if the person applying the salt is negligent or should reasonably have known there was a dangerous condition, for example. Joel Carlson, chief lobbyist for the trial lawyers group Minnesota Association for Justice, said his group supports the measures and worked on the clarifications. The bills also don’t address water softeners, the other main source of chloride pollution, said Rep. Peter Fischer, D-Maplewood, lead author of the House bill. Cutting down on road salt alone won’t solve the chloride contamination problem, but “it starts getting at it,” Fischer said. Forrest Cyr, government affairs director for the Minnesota Nursery and Landscape Association, has testified in support of the proposals. Cyr said he knows his members oversalt. They are under pressure, he said, from property owners and managers concerned about safety and mindful of negligence lawsuits. Owners want to see the salt, Cyr said. Testifying at the State Capitol recently, Tim Malooly, owner of Irrigation by Design in Minneapolis, suggested committee members check their shoes for salt damage. They all looked down, he said. Malooly said that while he hasn’t been sued, he knows many vendors who have. The pressure is real, he said. And it’s grown in recent years as more people move into low-maintenance or no-maintenance communities, he said, such as senior developments. Residents hammer volunteer leaders in those communities with phone calls and e-mails when walkways get icy, he said. They want pristine sidewalks and driveways. “They say: “Get out here and salt!’ ” Malooly said. The new program would build on the MPCA’s existing Smart Salting program, which focuses only on the Twin Cities. The expanded program would cost an estimated $200,000, including one new full-time position to run it. The change can’t come fast enough, some say. “We have 10,000 reasons why we need that legislation,” said Connie Fortin, president of Fortin Consulting, an environmental consulting company in Hamel. Fortin’s company works with government agencies, and provides the training for the Smart Salting program, funded mostly with grant money. Excessive chloride is toxic to fish and aquatic life, including bugs. Saltwater is heavier than the freshwater. In lakes, it sinks to the bottom and creates a layer that can interfere with the way lakes naturally turn over their water, Fortin said, with water from the bottom moving to the top and stirring up oxygen. Never attempt to pass or drive next to a snow plow when it's actually plowing. Plows can suddenly and unexpectedly move sideways from hitting drifts or by cutting through packed snow, according to the County Road Association of Michigan.These 13 winter driving mistakes can put you in danger. Often, plow drivers have limited visibility when clearing the roads. This is especially true when it comes to what's behind the plow. When plowing, a 'snow cloud' is often thrown up and this restricts visibility on all sides of the truck. The Minnesota Department of Transportation says motorists should stay back at least 10 car lengths between your vehicle and the plow. This will help prevent you from experiencing that 'snow cloud.' Try these 10 great hacks for removing ice and snow. In Washington state, snow plow drivers and maintenance crews work 10-hour shifts, four days in a row. 'They run two shifts per day and twice a day there are 90 minute periods when all the plows are off the road,' said Jeff Adamson, communications manager for the Washington State Department of Transportation. If it's heavily snowing, plow drivers may get called in on their off days. It can be taxing, as snow plow drivers have to concentrate in hazardous conditions for long periods of time.Make quick work of your own snow removal with these 13 snow blowing tips. 'Sometimes the weight of the snow coming off the plow will knock down a mailbox and sometime a driver may hit mailboxes when plowing along the curb line,' according to the City of Sun Prairie, Wisconsin. To help drivers, check to see if your mailbox is placed properly and conduct an annual check on the mailbox before the snow begins to fall. Here's a sturdy, low maintenance, DIY-friendly mailbox you can build. Different storms require different snow- and ice-fighting techniques, according to the City of Iowa City. If the temperature is below 20 degrees F and not expected to rise, salt isn't effective. The decision whether to plow or salt is made on the most recent weather information available. This is the best way to melt ice (hint: it's not salt). Trucks typically plow and salt at speeds of 45 miles per hour or less, according to the Livingston County Road Commission in Michigan. Of course that all depends on road conditions, so be sure to always be patient. Everyone needs these 13 things in their winter car survival kit. No matter how hard snow plow drivers work, roads will still be slick in some areas. Be cautious in areas such as intersections, off-ramps, bridges and shady areas. According to the State of Indiana, these are hot spots for ice. Here's the best way to remove an ice dam from your roof safely. Never attempt to pass a snow plow on the right side. Many plows have 'wings' that allow the plow driver to clear both the shoulder and the lane of travel in the same pass. According to the County Road Commission of Michigan, 'These wings can extend six feet from the plow and weigh as much as a small compact car. When obstructed from view by the 'snow cloud'' this poses a significant danger to motorists violating the law and attempting to pass on the right/shoulder of the road.' These are the 10 best practices for winter driving. If the roads are extremely bad or the storm is right over your location, consider staying put. 'We know this isn't possible all the time, but if it's an option, choose it,' according to the Kansas Turnpike Authority. 'The roads are dangerous enough, and with the unpredictability of other drivers, why risk getting into an accident?' These 14 incredible snow removal tools will make your life easier. Depleted reserves of road salt in eastern Canada's Ontario state have left precious little to use, while more heavy winter storms are expected to bring fresh ice and snow on roads across the state. Footage of a salt stockpile in Toronto, filmed this morning (February 22), shows only one large mound in a normally full dock, while the area is still mostly frozen. A combination of disruptions with state salt suppliers and an ongoing stream of storms and freezing weather conditions have left the local Canadian authorities at an unprecedented shortfall. As residents and commuters recover from Wednesday's treacherous freezing rain, they're seeing a familiar sight on Toronto's roads and sidewalks. Salt. Lots of it. Maybe even too much of it in some places. Sure, it helps both drivers and pedestrians keep from slipping and sliding on slick surfaces. But Anthony Merante, a fresh water conservation specialist for World Wildlife Fund Canada, says excess amounts of salt are having a negative impact on local wildlife. He says as the snow melts and turns to run-off water, thousands of tons of salt go with it, draining into the sewers, streams, and, eventually, Lake Ontario. Meanwhile, homeowners and contractors in Ontario are struggling to find road salt — the result of what many are calling an unprecedented province-wide shortage. Mark Mills, the superintendent of road operations, says the city uses between 10,000 and 12,000 tons of salt to fight storms similar to the one that hit Toronto Wednesday — he says that's typically the amount used when all 200 salt trucks are sent out. "What we have to keep in mind is we will always err on the side of public safety," Mills told CBC Toronto on Wednesday. "It will start affecting fish, turtles, frogs, and then upper levels of the food chains," Merante said. He said the solution is simple: use less salt. Studies show just using a small salt shaker would be enough to melt ice on a sidewalk slab, he added. To avoid overkill, he says each truck has an electronic control for spreading the salt, which caps at 100 kg per lane kilometre. He says pedestrians, cyclists, and drivers should call 311 if they notice that a lane or sidewalk has been over salted. "We often will see that there's a little more salt than maybe is required — we need to know about that," he said. Mills says the city will apply whatever it can — plows or salt — until the pavement is bare, which is a mandated level of service set by council. "We don't want to be held in any type of liability," he said. "We do understand that salt has an adverse affect to the environment, so there is a balance that we constantly have to look at." But it's not just the city that can be overzealous with the salt, Mills said. Property owners sometimes put too much down, as well, After all, they're expected to clear off ice and snow from their sidewalk, and can use "whatever materials they see fit" to ensure they aren't vulnerable to any sort of liability if a pedestrian is hurt. One Toronto woman says she understands why some property owners would rather be safe than sorry. "I think, just out of an abundance of caution, they put out a lot of salt," Elizabeth Takasaki said. Owners can be fined, or even sued, if someone slips and falls on their sidewalk. "Too much, far too much, it's overkill," said Shawn Draisey, when looking at the salt coating the cement near a King Street streetcar stop. "There's different ways to do this," he told CBC Toronto Tuesday. He says the people spreading salt on sidewalks either don't know how to cope with snow and ice, or don't understand the possible negative environmental impact. "We're in Canada and we've been doing this for a long time," he said. Ontario homeowners and contractors are struggling with what some are calling an unprecedented province-wide shortage of salt, leaving them with few options as an icy encore of freezing rain bears down a large swathe of Southern Ontario. An incoming storm from Colorado is expected to bring another wintry blast of snow and freezing rain to large area of Ontario, stretching from Windsor to Cornwall, with an area in the middle, stretching from London to Tobermory and Durham to Niagara, expected to be the hardest hit. The storm is moving in while salt supplies are meagre, thanks to a combination of last year's severe winter weather, a 12-week strike at the Goderich, Ont. salt mine and ongoing flooding at an American salt mine beneath Lake Erie in Cleveland, Ohio. "Having a three-month hiatus hasn't really helped the situation," said Gary Lynch, the president of Unifor Local 16-0, the union that represents workers at the Goderich mine. "We can produce a lot of salt in three months," he said, noting the strike has depleted reserves, which would have been mined and stockpiled over the course of last year's labour dispute. Since then, Lynch said the mine has been operating 24/7 with most miners working 12-hour shifts to churn out up to 300 tractor trailers worth of salt a day. "The guys are down there working their butts off, as fast as we can get it to surface, it's gone," he said. "We don't have any stock." The company that owns the mine, Compass Minerals, said last summer's strike "had very little impact" on production and while it has had supply challenges this winter, it insists they are only short-term. "Our inventory levels are typical for this time of year and we continue to ship packaged salt from production to warehouse sites daily," spokeswoman Tara Hefner wrote. What shipments are arriving at retail stores are selling out quickly, according to Tammy Dagenais, an assistant manager at a Windsor Home Hardware. "We just received a shipment, so [customers are] scooping it up maybe two or three bags at a time," she said. While some stores have stock, there have been reports of stores in the London and Waterloo regions turning customers away because of empty shelves. Government contracts take priority for salt miners, such as Compass Minerals, in the Great Lakes basin, but even some municipalities have indicated their supply is low. The municipality of Waterloo Region issued a statement Wednesday saying "salt stores are currently very low, due to difficulty in obtaining adequate volume from our supplier." The supply is so low in that area, the cities of Kitchener, Cambridge and Waterloo are using sand instead of salt on residential back roads in order to guarantee an adequate salt supply for main roads and bus routes. Complaints about slippery roads have more than doubled in Kitchener to 340 this year, compared to 168 last year. The dearth of locally available salt has forced many private contractors to look further afield to places such as Morocco or Egypt where prices are higher. "The salt price went up 50 per cent," said Dennis Leonhardt, the owner of London Snowplow and Landscape, who called the situation unprecedented. "Last year, I was paying $96 a tonne and this year I'm paying $145." Leonhardt said what makes the situation unprecedented is the fact this is the first time he's ever had to requisition salt from a foreign country, saying supplies are scarce not only in Ontario, but also most of the eastern United States. "My supplier doesn't expect it to become a whole lot better," he said. "This may become the new norm." Leonhardt said he believes once prices spike like they have this winter, it will be almost impossible for them to return to the levels they were even a year ago. "Maybe it will go down to $120," he said. "I don't see it going back down to what it used to be." osh Kurek is challenging his environmental studies students to think of ways to reduce salt use on Mount Allison University walkways and parking lots without hurting safety. Scientists have found freshwater lakes getting saltier each year because of runoff from salted roads. In Canada, the amount of rock salt used ranges from two to nearly five million tonnes a year, according to the Department of Environment and Climate Change. The estimate doesn't include salt used on sidewalks or by private homes and institutions. Mount Allison University, for example, spends $12,000 to $15,000 a year on rock salt, depending on the year. Kurek said he hopes his third and fourth-year students can come up with ways to maintain safe parking lots and pathways free from ice, while reducing the cost to the university and the environment. Kurek said studies show that even a small area of paved ground near a wetland can increase the risk of that lake becoming saltier. "In many lakes that are surrounded by urbanized areas, the levels in those fresh waters have increased over several decades," said Kurek. "There's no cost-effective, easy way to remove salt [from] fresh waters." Kurek said it's an important issue and a timely subject. "I'm teaching a course in the winter time about lakes and rivers and wetlands, and so I wanted to connect the students with something that's happening on the landscape right now. "Walking around campus, you certainly notice salt and sand everywhere." Amber LeBlanc, a third-year student, said tackling hands-on issues is one of the reasons she chose environmental sciences as a field of study. "We get to deal with things that are going on right now in the real world, real issues, and road salt is a major one." "It's in the front of my mind now." Kurek's class is working in tandem with another class at the university to help develop a plan to use less rock salt. David Lieske is teaching an advanced geographic information systems class to his fourth-year geography students. "One of the groups will be investigating the 'hotspots' of slippery ice on the campus walkways, by gathering observations directly, through information volunteered by the campus community, and through predictive mapping using a geographic information system based on environmental factors that can be expected to bring about slippery ice." Once slippery areas are determined, those spots may require more treatment, while other areas may need less. Salt use has caused problems across the country. Environmental researchers in the Greater Toronto Area are finding road-salt runoff is affecting local waterways to the point of damaging ecosystems and infiltrating groundwater supplies. But Kurek said that in the Maritimes, it's difficult to know the full effect of rock salt runoff. "We tend to do very little monitoring of fresh waters and even less monitoring of fresh waters in the wintertime," he said. With climate patterns changing, it's a topic that could become more pressing, he said. "I think we can expect to see more of these freeze-thaw types of events, so that's going to require some creative thinking about how we ensure safe sidewalks and roadways." Amber LeBlanc is looking forward to taking a crack at reducing salt use. "The ultimate goal is to come up with something that's doable," she said. Kurek said at the end of the term, students will have put together a plan to present to the university administration. With this week's snow and a round of freezing rain in the forecast, many streets and sidewalks in Vancouver have been covered with a layer of salt — a good thing for safety, experts say, but dangerous for the environment if it's overdone. Egan Davis has more than 20 years' experience in snow and ice removal, both for the City of Vancouver and in the private sector. He said the city is "fantastic" at using the right amount, but homeowners and businessowners often use too much. "Especially, gosh, this last week ... the amount of salt that went down, in my observation, was extreme. The sidewalks were just white and caked with it," said Davis, who commutes around the city on foot or by bike. "I've seen people shaking bags out." Davis, who also teaches horticulture at the University of British Columbia, said excess salt is simply bad for the environment. "When it rains, [salt] runs off and leeches into the soil and it can burn the roots of plants — I've seen plants die from this," he said. "And it ends up washed into the storm drains, untreated." Conservationists have also raised red flags about the effect road salt runoff has salmon, saying saltier water in spawning streams can increase egg mortality and lead to deformities in adult fish. The mineral is also corrosive to cars and bad for your pets. In Vancouver, trained city staff calibrate salting trucks so the right amount of grit goes on the roads. And the right amount does need to go down, for the sake of safety — Vancouverites are required to clear snow and ice from their sidewalks by 10 a.m. every day, or face a fine. Business owners can also be held liable if someone slips, falls and injures themselves on an unsafe sidewalk. The key, experts say, is using only what you need. "We do work really hard to find a balance between safety and using too much," said Erin Hoess, manager of street operations for the city. "But we would ask that residents only use what's necessary." Davis said a good rule of thumb for people at home is about a handful per square metre. For those who buy bagged products, it's best to read and follow the label as each product has a different rate. He said you know if you've overdone it if you're crunching along the sidewalk. "You shouldn't feel like you're walking across the salt flats," Davis said. Both Davis and Hoess said it's best to lay salt down before it snows, but when the path is already a little damp. Road salt works best in temperatures above –5 C, which is fine for balmy Vancouver, but inadequate for many cities and towns across Canada. In Prince George, B.C., the winter months are often too cold for salt to be effective on the roads. Engineering staff use a mix of fractured rock and sand instead, saving salt for "critical" areas prone for slips and falls — like steps. 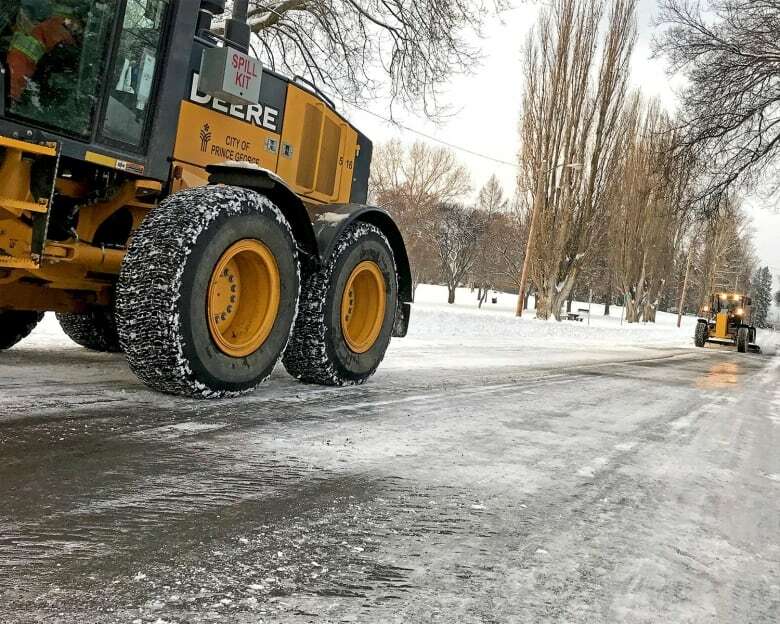 The rock and sand option is also cost effective: the grit is scooped back up off the roads in the spring to be reused when snow comes back in the fall. "We just keep it in the public works warehouse until next time," said city spokesperson Mike Kellett. Other wintry Canadian cities, like Calgary, are experimenting with other options like sticky, sweet-smelling beet brine. The reddish-brown mixture isn't corrosive to cars, unlike road salt, and works in conditions as cold as –20 C.
B.C. has also used beet brine on parts of the Coquihalla Highway where, again, it can be too cold for salt to work well. Recent warm weather melted a lot of snow, but as meltwater sluices into streams and sewers, it takes tons of road salt with it. Literally, millions of tons — an average of five million — are spread on Canadian roads each year, according to Environment Canada. Road salt dissolves with the snow and ice and washes into wetlands, creeks and lakes. Most of it is sodium chloride — table salt — known to adversely affect freshwater ecosystems, soil, vegetation and wildlife. Frogs and turtles — the canaries of fragile ecosystems — can’t survive elevated chloride levels. Rainbow trout die after a week of exposure to concentrations of 1,000 milligrams a litre. Some measurements in the Great Lakes region have found chloride levels as high as 20,000 mg/l. The chloride concentration of seawater is about 19,000 mg/l. Chloride is classified toxic under the Canadian Environmental Protection Act (CEPA). But road salts don’t make the list of CEPA’s Schedule 1 toxic substances because they’re considered a necessary evil. Many municipalities are test-driving alternatives to reduce salting. 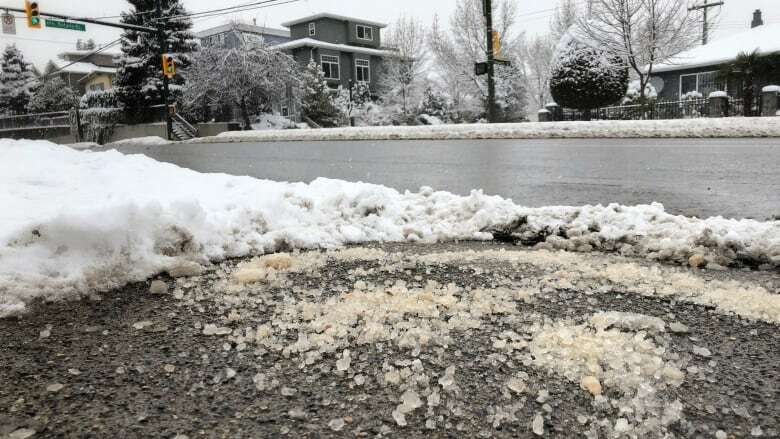 Calgary pre-treats roads with beet brine to prevent ice from forming. The sticky solution reduces salt application as much as 50 per cent, according to manufacturer Lugr Enterprises, and it’s far less corrosive than salt. Other municipalities are experimenting with cornstarch salt brine and wood chips. Roads are only half the battle. About 50 per cent of road salt contamination in the Great Lakes watershed may be caused by excessive salt use on private property, according to Live Green Toronto. Environmental advocates aren’t advocating Canadians stop using road salt, just that we use less of it. “You only need a very small handful for a sidewalk slab,” says Kelsey Scarfone, water program manager for Environmental Defence Canada. “If it’s crunching under your feet, it’s way too much.” And people may not realize salt is completely ineffective at temperatures colder than -10 C.
Some over-application is liability overkill. Corporate properties typically contract out plowing and salting. Contractors may not be educated in best practices, or they may over-salt to mollify clients’ fears of slip-and-fall lawsuits. Canada has a voluntary code of practice for environmental management of road salts, but there are no mandatory reporting requirements, either federally or provincially. Environmental Defence has joined WWF Canada and the Canadian Environmental Law Association in asking Ontario to create a provincial water quality objective for chloride. This step would allow for better monitoring of chloride levels, which is currently carried out by a patchwork of conservation authorities and municipalities, Scarfone says. Creating incentives for certification is a win-win opportunity, reducing both business costs and unnecessary salting. Scarfone points to New Hampshire’s successful Green SnowPro program, where the state indemnifies certified contractors against liability: a juicy carrot that removes the stick. In Canada, the Smart About Salt Council offers training and certification for salt application. Executive director Lee Gould suggests mandatory certification would be welcomed by contractors and business owners alike. A citizen advisory committee is urging city hall to adopt more environmentally friendly road treatments for the snowy, slippery winter season. London’s busiest roads get hit with a cocktail of rock salt and beet juice to melt the snow and ice, while residential streets see sand sprinkled at hills and intersections to bump up traction. omes at a price, some caution. “It gets into the waterways, it gets into food sources for wildlife, and then, of course, with infrastructure, it causes quick erosion of bridges and roads and sewers and the whole gamut,” said Mike Bloxam, a member of city hall’s advisory committee on the environment. Drivers have long fretted about the damage road salt does to vehicles, including speeding up rust. Bloxam said staff and politicians should investigate alternatives, including more eco-friendly products that can be swept away the same way as sand in the spring road cleanup. “I think there are ways we could plow (main roads) and apply other, non-corrosive, more environmentally friendly ice management tools than just simply always throwing down salt and being happy with it washing into the waterways,” he said. John Parsons, manager of roadside operations, said city hall’s use of salt – and the liquid spray, which is a mix of beet juice and sodium chloride – is part of its salt management plan, an Environment Canada requirement for any city that uses more than 500 tonnes of salt. London uses more than 40,000 tonnes of salt each year, spreading it across one-third of the road network. “We only salt our main roads and bus routes, because they’re higher speed,” Parsons said. The goal is to get down to bare pavement on those streets. It’s an attempt to find a balance between reducing the driving dangers during the winter season and mitigating the drawbacks of scattering the salty stuff. “We spread it for safety reasons,” Parsons said, adding that equipment and technology has helped improve practices, especially over the last decade or so. One example is the calibration on trucks, to allow city hall’s fleet – and contracted vehicles – to spread exactly the right amount of salt depending on the amount of snow and the speed of the vehicle. City crews also have the ability to spread a preventative layer of salt brine and beet juice on the road ahead of a snowfall, which helps stop snow from sticking to the road and makes plowing easier within a certain temperature range. That proactive strategy doesn’t use any rock salt, Parsons said.